Country Music Hall of Fame® and Museum recently (4/16) hosted I Saw the Light, a special program honoring the songwriting legacy of Hank Williams. Rodney Crowell, Ashley Monroe, the Secret Sisters and Steve Young each performed Hank Williams songs in addition to original songs inspired by Hank. Crowell also read an excerpt from his memoir Chinaberry Sidewalks about attending a Hank Williams concert as a child. Music City Tennis Invitational Songwriter Showcase was held at the Bluebird Café on April 21. The benefit concert was a pre-tournament event for the 38th Annual MCTI benefiting the Center for Child Development at Monroe Carell Jr. Children’s Hospital at Vanderbilt. The tennis tournament will be held April 30-May 1 at the Brownlee O. Currey, Jr. Tennis Center at Vanderbilt. 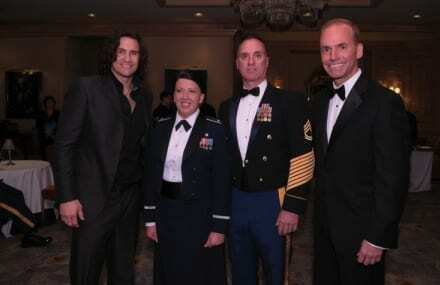 (L-R): Nichols with 1st Lieutenant Patricia Morton, USO-Metro Special Salute Honoree; her husband Sergeant First Class William J. Morton, US Army Retired and Dennis Muilenburg, President & CEO of Boeing Defense, Space and Security. 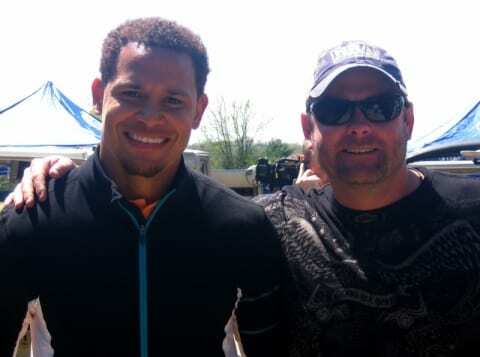 Andy Griggs and Tennessee Titans cornerback Cortland Finnegan hosted the annual Christmas For Kids Celebrity Golf Tournament held last week. Griggs has just released a new single called “Can I Get an Amen” and a full length CD will be available later this year. « Will Apple Be Next To The Cloud?